Reilly, Claire Olsen, NOPD, Ret. Claire Olsen Reilly, 86, entered eternal life on Tuesday, August 21, 2018. Preceded in death by her parents, Frederick Francis Olsen, Sr., and Irene Johnson Olsen Wappler; her brother Frederick Francis Olsen, Jr.; and her husband John Francis Reilly, NOPD, Ret. She is survived by daughters Kellie Reilly and Vicki Occhipinti (Joseph (Jay)); her grandsons Stephen Occhipinti and Michael Occhipinti (Laura), and great-grandchildren Anna Claire, Nina, Violet, and Paul Occhipinti; sisters-in-law Josie Olsen, Dorothy Jenkins, and Rosemary Woolsey; niece Carolyn Olsen Altobello (Johnny); and nephew Frederick Olsen III. Claire, who joined the New Orleans Police Department on December 4, 1953, would go on to make history as the first female in the NOPD to attain the rank of Lieutenant. She initially worked as an Identification Technician in what was then called the Bureau of Identification (B of I). 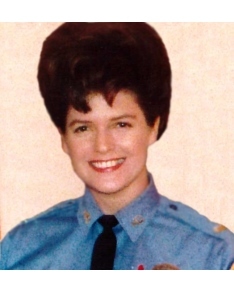 Graduating at the top of the 1955 Police Academy class, with the highest scholastic grade, she earned the top score on the Lieutenant’s Promotional Exam in 1968 to merit her rank. Olsen, as she was known on the job, served in the Detective Bureau and as watch commander of communications (then called 65), among other assignments. Over her 16 years of service, her duties ran the gamut from fingerprint classification to undercover work. Retiring from NOPD in 1970, Olsen remained a member of the Fraternal Order of Police and the Police Mutual Benevolent Association. She later worked at the University of New Orleans as an administrative assistant to the Dean of the College of Liberal Arts and subsequently in the English Department. A resident of New Orleans until Hurricane Katrina, Claire was a longtime parishioner of St. James Major Catholic Church. Since relocating to Lexington, Kentucky, she was a homebound parishioner of the Cathedral of Christ the King. Special thanks to Fr. John Lijana, Fr. Kiran Varaparla, and Deacon Paul Root for their visits and pastoral care. To the very end, Claire was an avid e-mailer who enjoyed reading books on her Kindle and listening to her favorite “cowboy” music.